Melvin Oden-Orr likes to tell his kids that he built the light rail. They look at their dad, impeccably dressed in suit and tie, and give him a quizzical look. Working for four years as an Assistant General Counsel with the Tri-County Metropolitan Transportation District of Oregon (Tri-Met), Oden-Orr oversaw the legal aspects of a $350 million light rail extension of one of the nation’s premiere light rail systems. In addition, he worked on legal issues related to capital projects and facilities, including construction, environmental, real estate, procurement, land use, federal regulations related to mass transit, and eminent domain. As an Associate General Counsel with the Portland Development Commission, he focused on secured lending, municipal and public law, construction and real estate development. “The most valuable lessons learned from serving PDC and Tri-Met is the role of government in providing public goods. Along with that, it was also valuable to see the importance of public involvement in holding the government accountable for how it goes about in providing public goods,” he said. Since starting his own firm in 2005, Oden-Orr is energized by the opportunity to work with small businesses – particularly those owned by entrepreneurs of color. Establishing his own legal practice after stints at Tri-Met and the PDC, Oden-Orr brings in-depth knowledge about municipal and public law. Spending much of his early years in the Los Angeles area, Oden-Orr studied political science at UCLA after a stint with the U.S. Marine Corps. His experience at the University of Illinois Law School was “great,” says Oden-Orr. “I was there to learn and work hard, but I wasn’t there to be part of the competition that goes on in law school. I was able to have really good relationships with a lot of my classmates from all cultural backgrounds,” he says. Melvin met his wife, Donna, then a law student at Lewis and Clark’s Northwestern School of Law while both attended an international legal studies program at the University of Nairobi. The couple did the long-distance thing for a year, visiting each other during term breaks. The decision of where to establish roots post-law school loomed. In a Q&A with Colors of Influence, Oden-Orr talks about owning his legal practice and value proposition to his growing base of clients. Your reason for studying law stemmed from your interest in politics and community activism. How do you integrate those learnings to your work as a corporate counsel? I believe in capitalism. I want to pass that belief in entrepreneurship and capitalism onto the younger generation, particularly young black men. There’s no better way to pass that lesson on than by being a walking, talking example of what hard work, dedication, a commitment to excellence can do for you. At the same time, you have to make time to give something back. That’s why I try to have a balance. I work hard. I expect to be compensated appropriately. But then, when I’m giving my time, I want to just give my time. I believe that there’s a lot of value in giving to your community. It establishes your relationship to the community. It creates all sorts of good will. You get to know people, and people get to know you outside of your professional duties. What spurred your decision to start your own practice? I set as a goal for myself to be the CEO of a major enterprise. A friend of mine approached me with the idea of starting a firm. Our partnership idea fell away, but the idea and goal was so invigorating that when the opportunity presented itself, I leaped – with the support of my fully-employed wife. What is the best thing about running your own practice? I get to decide what my firm looks like, in terms of its character, reputation, and the kind of work that we do. On any given day, I can make decisions about businesses and individuals to work with, without worrying about firm politics. I know my financial goals, and I know the image I’m trying to project for the firm. What are the key values of your practice? My commitment to serving my clients is paramount, and I want to serve my clients in a way that meets with the highest ethical standards. What is the most challenging part of starting your own firm? I want to have clients who will be my clients forever. I want to work on developing relationships with my clients. I’m looking for individuals and businesses who I can help grow, and I look forward to having a long-lasting mutually profitable relationships. What do you see as your primary charge as the corporate counsel for the National Association of Minority Contractors of Oregon? I have an interest in seeing minority-owned businesses thrive and grow. I’m always looking for opportunities to help be part of that. Having worked for public agencies, I’ve been able to learn about a lot of the efforts that minority contractors have been engaged in to try to advocate for greater opportunities on public projects; to create a level playing field. Working with NAMCO, I’m able to help them be mindful of the legal issues that arise for the organization and its membership. There is no shortage of legal issues. What do you do best? I have a broad business and government law background that includes transactional and litigation experience, which allows me to look at issues from a number of different perspectives, then advise my clients appropriately. What is the most enjoyable aspect of your work? Dealing with people. So much of what I do is about educating people about the law and how it applies to their situation. When I deal with people who are looking to start a business or who are in the middle of starting a business, I’m able to give them some guidance about what they’re looking at in terms relevant risks, contractual issues and a general look at the legal context they will be operating in. How does your cultural background affect the way you run your practice? My cultural background helps me understand that everyone needs to be treated with respect and address them as an individual. I can’t make assumptions about them based on what they look like when they walk in the door. I’ve talked with people who have money, and those who don’t. I’ve even talked to people who have spent time in jail, and who now are looking at starting their own business. I can’t let the fact that they have this history impede my ability or willingness to give them legal advice. Especially when they might make a mistake that might send them back to jail. What is one of the most common legal issues that you encounter in your work? The contract is critical. People need to understand the importance of a written agreement. Some think of it as a minor technicality, when in fact it is the most crucial part of any business dealing. People take for granted that the good feelings they have with a colleague or partner is always going to be there. When things don’t go well, accusations fly especially when there’s money on the line. How can new professionals succeed in a legal career? The only way that you can look forward to having any control over your career is by establishing your reputation. You can only do that if you go out and meet people in professional situations. Give your time to local nonprofits, work on some governmental committees. It’s one of the most important things you can do to chart your own destiny. Do things to establish yourself as a professional aside from sitting in your office. What do you find most fulfilling about your community work? I’ve been involved for about 10 years with Youth Employment Institute, an alternative school that provides pre-employment training program. It is the most important thing I do outside of raising my own children. We work with youth ages 14-22 to help prepare them for the workforce. We give these young folks, mostly disadvantaged youth, single-parents, foster kids, and offenders, a second chance to be successful in life. I serve on the board. Started out being a person that came in, talked to the kids about the law and how to become a lawyer. It has been an honor to serve. The way I think about it is that if I had made different choices, my life could have been different. I want these kids to know that life is about choices and they have to try to make good ones. You can make a good choice at anytime in your life to make it better. 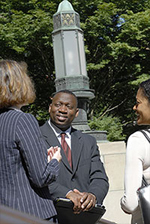 Oden-Orr Law is committed to supporting diversity within the legal profession and increasing opportunities for attorneys of color to pursue the full spectrum of career paths in law. The firm, certified with the State of Oregon Office of Minority, Women and Emerging Small Business as both Minority-Owned Business Enterprise and Emerging Small Business, intends to expand by recruiting and retaining experienced and highly-skilled attorneys, including attorneys of color, for membership and associate positions. Oden-Orr was the inaugural Chair of the Diversity Section of the Oregon State Bar for 2002 and 2003, and served on the Executive Committee for the term 2002-2004. 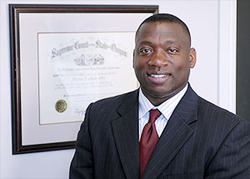 In his leadership roles with the Diversity Section he organized a number of major Diversity CLEs for both the 2002 and 2004 Bar Conventions, involving such major corporate legal department participants as Nike, Inc., Kaiser Permanente and Microsoft, Inc. Among the topics addressed were the legacy of the U.S. Supreme Court’s decision in Brown v. Board of Education in light of the High Court’s recent decision in Grutter v. Bollinger and the business case for increasing diversity in the legal profession. Oden-Orr also served three years with the Multnomah Bar Association, Committee to Advance Equality in the Profession and Justice System, where he facilitated the creation of the MBA’s Middle School Mentoring Program, designed to expose students of color to the legal profession. He served as the President of the Oregon Chapter of the National Bar Association, the national organization dedicated to, among other things, protecting the civil and political rights of all citizens and residents of the United States, and whose membership consists primarily of African-American attorneys and law students.